North of Luxor are the impressive temples at Dendara and Abydos. The Temple of Hathor at Dendara is dedicated to the cow goddess of joy and sexual love. This beautifully preserved temple displays a Ptolemaic architectural style. Abydoa Temple is a shrine to Osiris, the god of the afterlife, and was an important place of pilgrimage for Egyptians. The temple displays many fine carved bas-reliefs. Luxor, or Thebes as it was known then, was capital of Egypt during the Middle and New Kingdoms between 2134 and 1070 BC during the height of Egyptian power. What has been left behind are the most magnificent series of buildings, temples and relics in Egypt and some of the finest historical monuments in the world. On the west bank of the Nile at Luxor is 'Thebes of the Dead' where funerary temples and tombs of pharaohs and other dignitaries were built over 15 centuries. 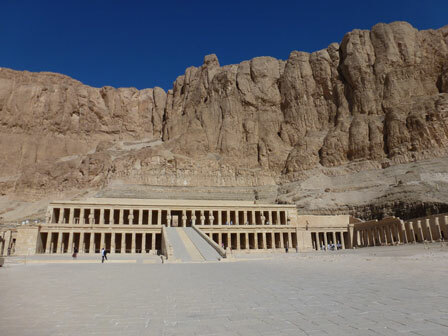 The most significant cemetery is the Valley of the Kings which contains the tombs of over 60 pharaohs, including the tomb of Tutankhamen discovered in 1922. A hillside entrance takes you underground to the burial chambers with the walls covered in brightly painted images and hieroglyphs. Other features in this area include the Colossi of Memnon, huge twin statues of Amenhotep III, and the Temple of Queen Hatshepsut, a monument to the only female pharaoh which has a spectacular setting and scale as well as finely detailed carvings. On the east bank of the Nile is 'Thebes of the Living' featuring the remarkable Luxor and Karnak Temples. The temples were dedicated to the gods Amon, Mut and Montu. Karnak Temple is an astonishing site, built over a period of 1,500 years. 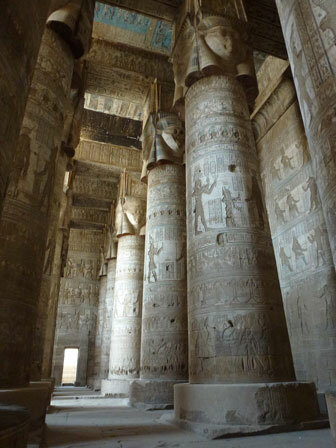 The Great Hypostyle Hall contains 134 columns in 16 rows, resembling papyrus stalks, each 23 metres high, and carved with scenes of the King worshipping Amon. The Luxor Museum is also well worth a visit, with an excellent display of relics from the temples and tombs of Thebes. 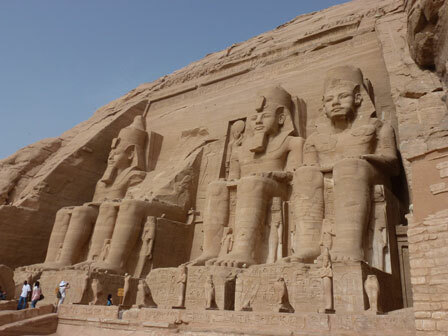 The Great Temple of Ramses II was built at Abu Simbel in the Nubian desert in the 13th century BC. The temple is guarded by four colossal statues of Ramses (each 20 metres high), one of Egypt's great pharaohs and known as the Great Builder, carved into the cliff face. They were buried in sand until being discovered in 1813 and 150 years later were in danger of being submerged due to the construction of the Aswan High Dam but a UNESCO project led to the relocation of the statues to higher ground overlooking Lake Nasser, now staring east at the rising sun. Organised group tours: Click here to see 11 tours to Nile Valley which may include Egyptian Temples.